This is a scale model of the lifeboat William Gammon, gifted to the museum in 1992. She was named in memory of the coxswain of the Mumbles lifeboat, Edward,Prince of Wales, who with seven crew men lost his life on April 23rd, 1947 whilst attempting to rescue the crew of the Samtampa, wrecked in a hurricane off Sker Point. 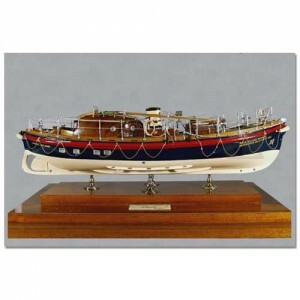 This model and the original lifeboat are currently housed in the Museum Stores at Landore, Swansea. The lifeboat, William Gammon, appears on the National Register of Historic Vessels, she is 14.3m long with a displacement tonnage of 20.9. She was built in 1947 by Groves & Gutteridge of Cowes and served as a rescue lifeboat until 1984, starting her working life as the replacement vessel for the capsized Edward, Prince of Wales at Mumbles and retiring from station at Manchester. During his career, Cox William Gammon was awarded two medals for conspicuous gallantry, the first, in 1941, a bronze medal for his part in the rescue involving the Cornish Rose and the second, in 1944, a gold medal for his part in rescuing the crew of a Canadian frigate, HMCS Cheboque.